Mr. 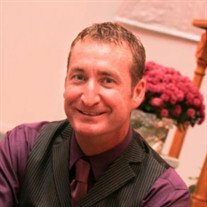 Troy L. Clere, 51, of Murray, passed away on Sunday, November 11, 2018 at Skyline Medical Center in Nashville. Troy was born in Marion, OH to Rev. E.F. and Nancy White Clere on May 8, 1967. He was an avid sports fan and softball player. Troy proudly served his country in the United States Air Force and was a veteran of Operation Desert Storm. He worked for AECOM as an Aviation Air Frame Engineer. His mother, Nancy Louise Clere, precedes him in death. Those left to cherish his memory include his loving wife, Cassandra Clere; three daughters, Ashly Tiffany, Cydney Jillian, Amaya Grace; his father and step mother, Rev. E.F. and Phyllis Clere; three brothers, Shawn Clere (Brittney) of Murray, Todd Clere (Angel) of Murray, Stacy Clere (Kendra) of Symsonia and four grandchildren, Carson, Cameron, Hannah and Henlee. The funeral service honoring Troy is set for 11 AM on Friday, November 16, 2018 at the Heritage Chapel of Imes Funeral Home, 1804 Highway 121 Bypass North, Murray. Ricky Cunningham will officiate and entombment with military honors will follow at Murray Memorial Gardens. Pallbearers include Todd Clere, Stacy Clere, Shawn Clere, Aaron Scott, Terry Birdsong, Dave Cortazzo. His grandsons will serve as honorary pallbearers. His family welcomes visitors from 5 PM-8 PM on Thursday, November 15, 2018 at the Heritage Chapel. Expressions of sympathy may take the form of donations to American Cancer Society, PO Box 22478, Oklahoma City, OK 73123.